McKey Perforating Co., Inc., New Berlin, WI, perforates parts for a broad range of industries, including construction, agricultural, automotive and architectural. The diversity of its work presents the challenge of processing all types of materials, including light-gauge sheetmetal, exotic alloys and heavy plate, to increasingly high accuracy requirements and just-in-time schedules. To maintain its competitiveness, McKey, a wholly owned subsidiary of Diamond Mfg. and part of the Reliance Steel & Aluminum Co. recently invested in a gantry-style CO2 laser-cutting machine (a 4-kW LVD Strippit Sirius 3015 Plus). The machine, installed late in 2011, has increased McKey’s productivity 20 percent, improved part edge quality and reduced cycle times. 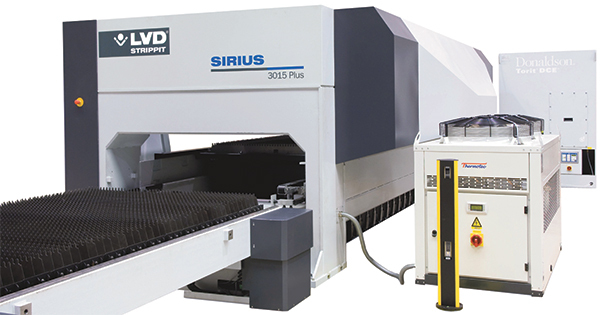 McKey Perforating’s Sirius 3015 Plus laser-cutting machine includes an integrated automatic shuttle table; table changeout occurs in less than 30 sec. McKey was founded in 1860 in Chicago, and moved to New Berlin, WI, in 1957. It cut its teeth providing heavy-gauge perforated flooring for breweries and for the mining industry. Perforated metal gains favor for its ability to separate, size or filter solids, liquids, light, air and sound. Through the years, the contract manufacturer complemented its expertise in perforating by investing in equipment for its 72,000-sq.-ft. plant to offer value-added inhouse services, including shearing, forming, welding and laser cutting. A second 40,000-sq.-ft. production facility, opened in 2000 in Manchester, TN, manufactures perforated tubing primarily for the automotive market. While McKey is a leader in its field, competition is strong. The machine’s cutting head generates “clean cuts” and accommodates 5- and 7.5-in. quick-change lenses. 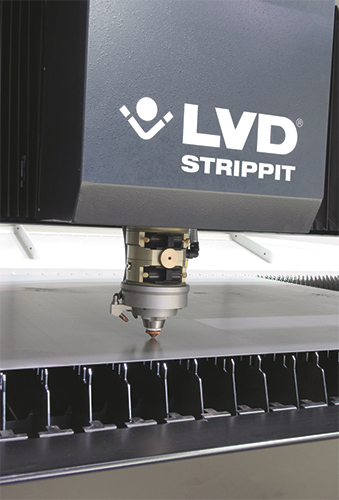 The firm’s new 5- by 10-ft. laser-cutting machine cuts at a combined axis speed of nearly 4000 in/min., and features an integrated shuttle table that can be changed over in less than 30 sec. Sheet referencing is automatically handled by a built-in capacitive height sensor, which maintains a constant distance between the head and the workpiece. The machine’s optical-sensor referencing system provides automatic and noncontact sheet referencing. A perforated part is moved to the laser, quickly referenced and then cut to its final configuration. “Since bringing the Sirius 3015 Plus into the shop, our setup time has been reduced by some 15 min. per job, by having the equipment perform the alignment,” reports director of operations Don Pirlot. The 4-kW laser source gives McKey the versatility to cut thick and thin materials at maximum feed rates. Nitrogen assist gas is used to process parts oxide-free and without burrs, reducing or eliminating time-consuming finishing operations and producing parts more cost effectively. The advent of fiber-laser technology and a broad range of hybrid, flying-optic and high-speed CO2 systems give metalformers plenty to choose from when it comes to laser-cutting systems. Here’s advice for the first-time buyer. • What material types, thicknesses, workpiece size and volumes will the cutting machine process? Consider existing work and potential future projects. • What level of technology and budget best suits the application? Could be an entry-level machine capable of producing 50 to 150 sheets/day, or a high-volume machine rated for more than 150 sheets/day. Next consider how much expertise the company has regarding laser technology, and stay focused on your particular application needs. For example, while the market for fiber-laser systems has doubled in the past three years, a solid-state fiber laser is not the best choice for metalformers looking to process a wide range of materials and workpiece thickness. Machines operating CO2 lasers are best suited for cutting mid- to heavy-gauge materials, while fiber lasers are recognized for their speed in cutting thin-gauge material. • What are the expected operating costs of the cutting machine? These costs include laser gases, chillers, energy and floor space, as well as maintenance costs. Fiber lasers, for example, have lower operating costs than do CO2 lasers, since the fiber laser consumes about 60 percent less power. • How much floor space (footprint) is required to install the machine? Ensure that automation can easily be added in the future without having to remove the machine from its environment. • What laser resonator technology is used (DC, RF, fiber)? The laser gas used in a DC laser is in direct contact with the electrodes. As a result, DC lasers are forced to purge more often, which often means higher laser-gas consumption. Conversely, a fiber does not require a lasing gas. As a first-time buyer, training and service support are especially critical to the success of a cutting machine. While intuitive touchscreen control interfaces and automated features such as adaptive laser cutting (which adjusts laser power and assist-gas pressure in relation to cutting speed) make today’s laser systems relatively simple to operate, they do not eliminate the learning curve. For example, first-time users will still need to learn how to correctly install or replace a lens or nozzle. Be sure to define the amount of training provided by the supplier, and if service technicians are locally based. Try to split the training into two sessions: one week of training just after the installation, and the second week following a couple months of use. Automation also is a key consideration. Material-handling or warehousing systems allow a continuous, even flow of work through the cutting machine, keeping uptime high. Systems with integrated shuttle tables allow one table to be loaded while the machine cuts on the second table. Table changeout generally occurs in less than 30 sec. Warehousing units provide full capabilities for loading, unloading and storage of raw material and finished parts. And while most machines can be configured to accept modular automation equipment in the future, this option must be defined at time of purchase. The system’s RF-excited fast-axial-flow CO2 laser, CNC control, drives and motors are fully integrated, ensuring high reliability, as well as low operating and maintenance costs. Pirlot also reports a cost savings on laser gases, as the helium and oxygen gas efficiency has proven better than expected. McKey employs the laser-cutting machine to process aluminum, cold-rolled and hot-rolled mild steel, and Types 304 and 409 stainless steel. It cuts hot rolled to ½ in. thick and 304 stainless to ¼ in. The machine’s edge-function feature, reports Pirlot, processes sharp corners cleanly, particularly in thicker materials. Processing thicker materials is important for the company, as it’s built a reputation for perforating heavy-gauge plate to 1 in. thick. McKey relies on the laser’s process-control capabilities to automatically sense piercing times and detect and control plasma when cutting stainless steel. This feature keeps processing time high while minimizing part damage due to loss of cut. The system features an integrated shuttle table, which also helps keep uptime high by allowing one table to be loaded while the machine cuts on the second table. And, the shuttle-table design allows the firm to process long workpieces, “including a 12-ft.-long stainless-steel part for an architectural customer,” Thurman says. The system is automation-enabled, so that McKey can retrofit it with a material-warehousing system at a later date. McKey is phasing out its older laser and offloading more work to the new machine. Business has been good for McKey. Thurman appreciates the importance of employing advanced technology to keep the company well-positioned.